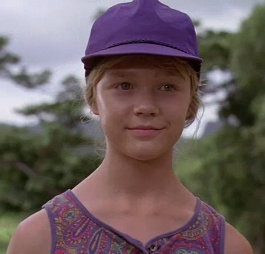 Thirteen-year old granddaughter of John Hammond and older sister of Tim Murphy. 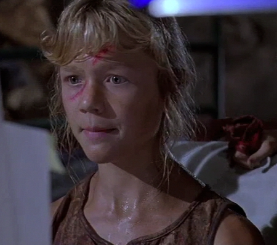 She and her younger brother came to Jurassic Park to visit their grandfather, and also to go on the initial tour of the park, since Hammond seemed to be specifically aiming the park at children. A bit of a computer nerd and a self-described “hacker,” Lex was amazed by the level of technology displayed in the Explorer tour car’s onboard CD-rom system. During the tour she disliked the fact the Tyrannosaur was fed live goats, but was nonetheless disappointed when the dinosaur did not show itself at first. Lex was very nearly traumatized by the Tyrannosaur’s attack on the tour vehicle she and her brother were in when Donald Gennaro, who had been riding with them, abandoned them in panic moments before the attack came. Because of this, she at first refused to leave Dr. Alan Grant’s side following the ordeal. Eventually though, she calmed down and became her old self again. After arriving at the Visitor’s Center and narrowly escaping death at the claws of Velociraptors in the kitchen, she ran to the control room with Grant, Dr. Ellie Sattler and Tim. 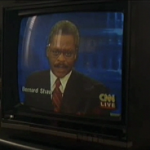 There, she used her computer skills on Dennis Nedry’s computer and managed to fix what he had done by rebooting the phones and door locks, allowing the survivors to call for help. She survived the ordeal. Like her brother, she showed up again for a brief renunion with Dr. Ian Malcolm at their grandfather’s mansion four years later. Alexis “Lex” Murphy was played by Arianna Richards.